One hundred selected works have been announced for exhibition at the National Weather Center Biennale, which opens to the public in April. A total of $25,000 in prizes will be awarded in three categories, plus a Best of Show. Late spring and early summer typically reveal active weather patterns in Oklahoma, and this year will establish a new precedent. However, this particular weather can only be found indoors. The National Weather Center and the Fred Jones Jr. Museum of Art at the University of Oklahoma have teamed up with the Norman Arts Council to present the first international biennale to be held at the National Weather Center Atrium beginning Earth Day, April 22. The National Weather Center Biennale showcases art’s window on the impact of weather on the human experience through three media – painting, works on paper and photography. Initial jurors have selected 100 works for display at the exhibition from more than 700 pieces submitted by nearly 400 artists representing all 50 states and multiple countries. A panel of three guest jurors will select a winning piece from each of the three categories as well as name one piece the Best of Show. The final jurors are Christoph Heinrich, the Frederick and Jan Mayer Director of the Denver Art Museum; Spencer Finch, an American artist specializing in glass and light installations; and Jacqui Jeras, a broadcast meteorologist with WJLA-TV in Washington, D.C.
Moore also is the dean of the OU College of Atmospheric and Geographic Sciences, vice president of Weather and Climate Programs, and Chesapeake Energy Corporation Chair in Climate Studies. 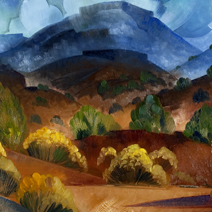 Category winners will receive $5,000 each and the overall Best of Show winner will be awarded $10,000 and a full-page advertisement in an upcoming issue of Southwest Art Magazine. The winners will be announced during the exhibition’s opening. Atkinson, Moore and Gavaghan served as initial judges who were tasked with narrowing the talented pool of entries to the final 100 works that will be on display at the National Weather Center. The selected works, including the prize winners will be featured in the biennale exhibition, which is open to the public at no cost. The exhibition officially opens on Earth Day, April 22, 2013, and closes June 2, 2013. The exhibition is open from 10 a.m. to 5 p.m. Monday through Thursday, 10 a.m. to 7 p.m. on Friday and 12 p.m. to 5 p.m. on Sunday. Visitors will need to present a photo ID for entry. Additional information about the exhibition is available at www.nwcbiennale.org and the biennale’s Facebook and Twitter pages. Completed in 2006, the 244,000-square-foot National Weather Center building is the anchor of a unique research and learning community that includes the nation’s largest academic meteorology program; five National Oceanic and Atmospheric Administration research, operations and support organizations; and more than a half dozen private weather and weather technology-related companies – all located within a few hundred yards of each other on the OU Research Campus in Norman, Okla. The central space for the exhibition will be the 9,600-square-foot atrium with gallery lighting and full security. The National Weather Center’s website is www.nwcnorman.org; the Fred Jones Jr. Museum of Art’s website is www.ou.edu/fjjma and the Norman Arts Council’s website is www.normanarts.org.